Roger Williams, clergyman, advocate of religious freedom, founder of Rhode Island, born in London. A protege of Sir Edward Coke, he graduated from Pembroke College, Cambridge, in 1627 and took Anglican orders. He early espoused Puritanism and emigrated to the Massachusetts Bay colony in 1631. Williams became a teacher (1632) and, after a stay at Plymouth, minister (1634) of the Salem church. However, his radical religious beliefs and political theories - he denied the validity of the Massachusetts charter, challenged the Puritans to acknowledge they had separated from the Church of England, and declared that civil magistrates had no power over matters of conscience - alarmed the Puritan oligarchy, and the General Court banished him in 1635. In the spring of 1636 he founded Providence on land purchased from the Narragansett. To Providence, a democratic refuge from religious persecution, came settlers from England as well as Massachusetts. There were four settlements in the Narragansett Bay area by 1643, when Williams went to England. Through the influence of powerful friends such as Sir Henry Vane (1613-62), he obtained from the Long Parliament a patent (1644) uniting the Rhode Island towns of Portsmouth, Newport, and Warwick with Providence. In 1651, William Coddington secured a commission annulling the patent, but Williams, with John Clarke, hastened again to England and had the patent restored. (Its grant of absolute liberty of conscience was later confirmed by the royal charter of 1663.) 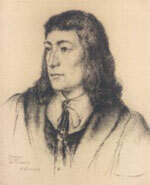 On his return in 1654, Williams was elected president of the colony and served three terms. Always a trusted friend of the Native Americans (he wrote "Key into the Language of America", 1643), he often used his good offices in maintaining peace with them, but he was unable to prevent the outbreak of King Philip's War (1675-76), in which he served as a captain of militia. Williams, though he remained a Christian, disassociated himself from existing churches. His writings, reprinted in the "Narragansett Club Publications" (1866-74), reveal the vigor with which he propounded his democratic and humanitarian ideals. "The Bloudy Tenent of Persecution for Cause of Conscience" (1644) was condemned by John Cotton, who was answered with "The Bloudy Tenent Yet More Bloudy" (1652). Other works include "Queries of Highest Consideration" (1644), an argument for complete separation of church and state; "The Hireling Ministry None of Christ's" (1652); and "George Fox Digg'd Out of His Burrowes" (1676), a polemic against Quaker teachings. Of great personal charm and unquestioned integrity, Williams was admired even by those who, like both the elder and the younger John Winthrop, abhorred his liberal ideas.